There are 17 posts in this thread, and it has been viewed 8193 times. Riding Hero. What do you think of it? This week it's time to step on the gas of some two-wheeled speed machines. 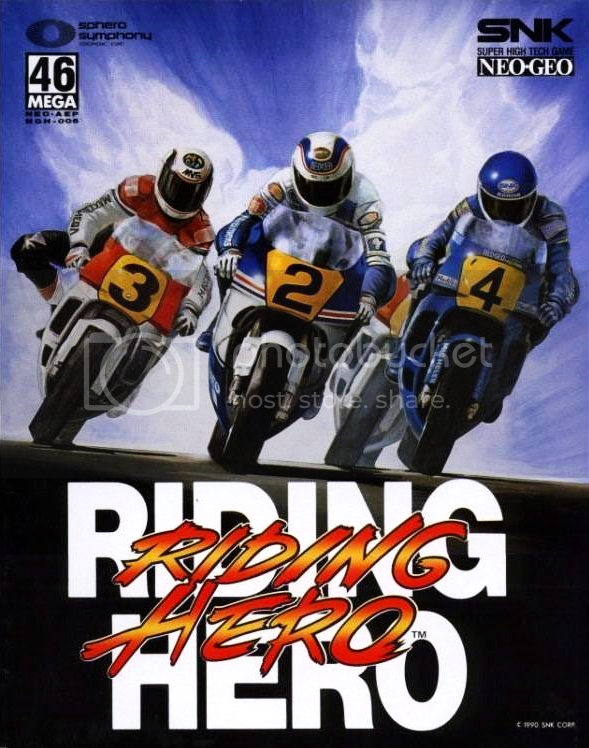 As one of the launch titles, Riding Hero was released in the earliest era of the Neo Geo in 1990. 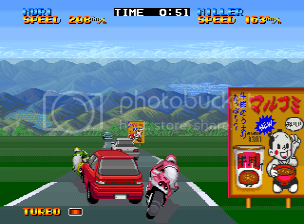 Just like in the tradition of Sega's Hang-On, the graphics consist of a scrolling screen that gives a sense of depth, while the road edges and trackside items fly by to give players a sense of speed. 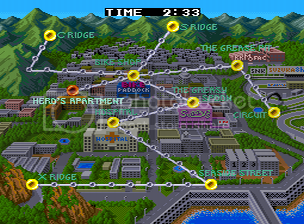 One of Riding Hero's specialties was the 4 Player link-up mode, which could be used in the AES and MVS version of the game using plugs on top of each cartridge. Give this Neo Geo starter a go and tell us what you think about it! Any comments are always welcome. Furthermore, Priest and I have been thinking about a new, temporary High Score Challenge policy. In the future we only set up an according HSC if there's any interest for participation. So if you would like us to create a HSC, please contact me or Priest. Riding Hero is a 2D motorcycle racing game that offers a view of the world from behind the rider. The game includes two modes of play: a standard racing mode and a career mode. 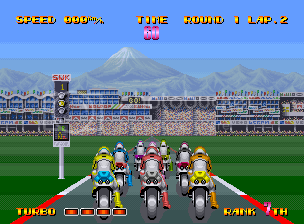 In the standard racing mode, players participate in a race against several CPU motorcycle riders using one of four motorcycles. The goal is to pass all the CPU opponents and end up in first place. Career mode gives players a stack of money and sets them off on a quest to acquire the ultimate motorcycle. have I ever heard anything positive said about this game. Do people think the Neo Geo could do an Outrun style game, from a technical point of view i mean? I know it has sprite scaling (or more accurately, sprite-reducing) but i've never seen the sprite scaling used to that extent in any Neo Geo games. I think the main problem with this game is that the gameplay is too frustrating and unforgiving. It's very easy to bang into other riders on the very narrow road resulting in a big loss of speed and you can't use a turbo until you reach a certain speed. Also the time limit is quite strict in GP mode. The story mode is an interesting idea with it's rpg elements and being able to tune your bike or buy a new one. The problem is you seem to spend most of the time in very slow moving and rather uninteresting conversations with people and not enough time racing. Despite what I said I am starting to like this game a bit more and might even buy it for NGCD. The graphics are not too bad really. I used to spend countless hours playing the excellent Super Hang On on the Mega Drive so like the idea of a similar type of game for Neo Geo. Like most games I imagine it would be much more enjoyable in 2 player mode. Has anyone here actually tried that? I give this game credit for being from a unique, yet little known genre: racing-RPG. I know of two other games that do it: Final Lap Twin (TG16) by Namco and Racing Lagoon (PSX) by Squaresoft (I wouldn't consider Gran Turismo a racing-RPG). All the additional features thrown in, like world "exploring," talking to people and upgrading, e.g., are such signatures of an SNK game. For what a game lacked in actual gameplay, SNK made up in extras like this. Unfortunately, the gameplay is awful, far off in the distance from Hang-on (the arcade game, of course). The worst part of this game is using a joystick to control the cycle � that is how it's meant to be played. 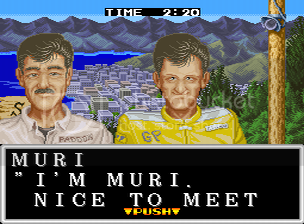 It doesn't help that I generally don't care for 2-D racers either. I can give Riding Hero a passing grade, just barely. It's the only forward-scaling racer on the Neo which works slightly in its favor. That it's the the only representative of this genre on SNK's killer console makes it a unique curiosity. The lack of competition doesn't disguise the fact that it's a mediocre game featuring a few unique and creative ideas that, unfortunately, are often overshadowed by a larger number of lousy ones. Indeed, the gameplay is also my first area of contention. The slightest brush with another vehicle brings your bike to a screeching halt without any effect on theirs. Often these bumps come from behind so you have no way to see the oncoming rider until you've already been hit. Initially, I disliked having to manually straighten out your bike after turning. I'm used to this being automatic in most racing games but with time Riding Hero's manual steering became less of an annoyance as I simply got used to it. Riding Hero's uninspiring music fades into the background and is easily forgotten ( to compensate, I caught myself humming tunes from Super Hang-On on more than one occasion ). The graphics are decent, IMO. Yes, they're bland but colorful and smooth enough to avoid being a major sticking point. The scaling is minimal but effective enough to make it the only area, however minor, that Riding Hero actually outperforms Super Hang-On for the Genesis. I logged in many hours playing that game when it was released back in '89- hours I'm unlikely to devote to this inferior title. Even with it's many flaws, I'll still play Riding Hero from time to time. I don't think it quite deserves it's terrible reputation and feel that it's worth a try for diehard fans of the genre. It's worth noting that I have a Japanese AES so I really can't explore the game's story mode or comment on it. If I could read Japanese, perhaps the game would get a little more attention than it currently enjoys. Priest, I believe at least two showings of interest (with intent to enter) should institute a HSC. Two or three entries would at least make it worth your while, IMO. I had this and utterly hated it - I agree with some of you in the the RPG element added some replay value, but aside from that - it really is awful imo. Since this topic was brought back from the past I'll post on it. Yes I hate it!!! After buying it this summer I've not spent much time on it but I can't even pass the first stage. Satoshi Tajiri reviewed this and Ninja Combat back when he worked for FamiMaga. Thankfully, I've never had the chance to play this. And after watching the video it doesn't even compare to, say, Road Rash on the Megadrive. If the road was wider, and the motorcycles were replaced with cars then it might be halfway there to a Neo Outrun. And that's what I'd like to see as a new homebrew game for the system; I reckon the Neo Geo could do a fantastic Outrun-style racer. There was no 4 player mode on AES, was only 2 player, up to 4 on MVS only. Awww man... now that would have been cool. Neo Road Rash! Outrun was an okay game but even that is not my type of racer.